An "Eat Bulaga!" scholar, Jaydee Niere Lucero, topped the November 2018 Civil Engineering (CE) board exams. The University of the Philippines alumn on Friday wrote a thoughtful message for everyone who helped him achieve his goals in life. At the top of his thank you list was the noontime show "Eat Bulaga!" and its EBest scholarship program. Jaydee became an "Eat Bulaga!" Excellent Student awardee in 2009. He graduated top of his class at Camain High School. "Sa Eat Bulaga, sa pagpapaaral ninyo sa akin (at sa aming mga EBEST scholars) for the past 9 years. Hindi ko marahil mararating ang tagumpay na ito kung hindi dahil sa inyo, thank you po!" he said. 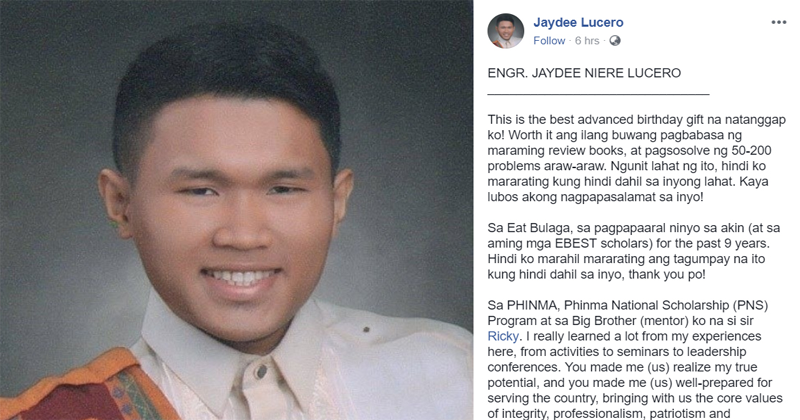 Jaydee also thanked the Phinma National Scholarship (PNS) Program, Review Innovations, Facebook groups Math Enthusiasts Quiz Group and Civil Engineering Board Exam Problems, and all of his friends — especially those who lent him books and calculators. Most of all, he thanked his family for their unconditional support. "Kay papa Alberto Lucero na nasa Heaven at laging nandyan para sa amin, lahat ng tagumpay kong ito ay dedicated din para sayo." 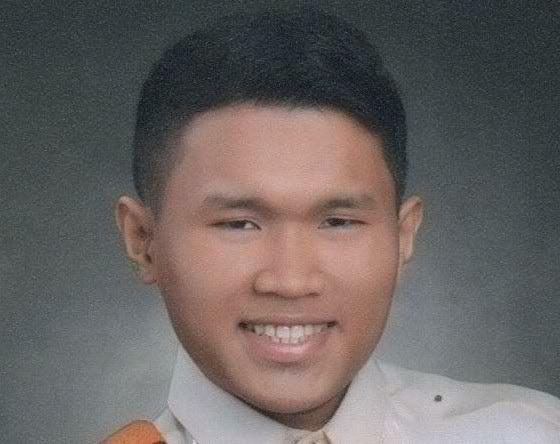 Jaydee scored 97.20 percent in the CE board exams. Only 6,262 if the 13,887 who took the test passed. UP Los Baños is listed as the top-performing school in the November 2018 CE board exam, followed by Carlos A. Hilado Memorial State College - Talisay, UP Diliman, Bohol Island State Iniversity - Tagbilaran, University of Pangasinan, and University of Santo Tomas.